The weekend of April 15th and 16th saw the 2016 Sportshall UK Final take place one again at Sportcity, Manchester. With over 400 athletes involved across the weekend the competition saw the highest ranked individuals and teams from across the UK battle to be crowned UK Champions in both the team competitions and across a range of individual events. Saturday 15th saw the winners of the under 13’s Regional UK Championships events take to the track and into the field to work hard and earn points for their team. 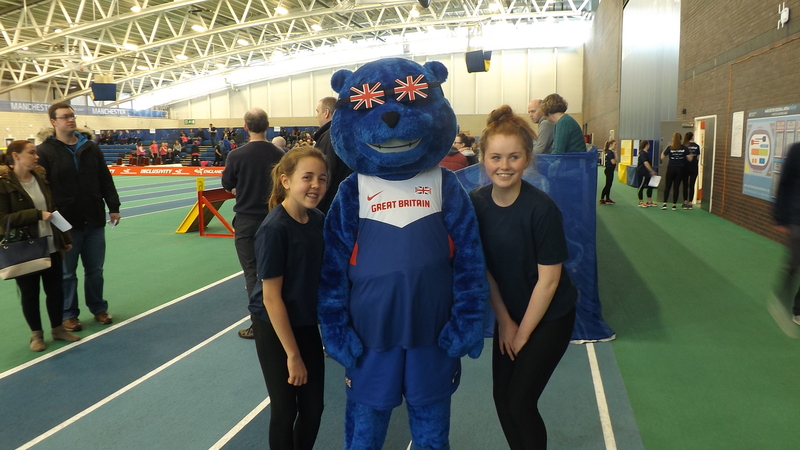 On their way to success in the girls competition Norfolk secured victories in almost half of the track events and performed strongly across the board in the field events too with a particularly impressive winning Speed Bounce performance of 88 from Ellie Morgan (Great Yarmouth AC). In other events Bekki Roche (Liverpool Harriers) was selected to compete in the Shot as the best individual from across all the Regional events that took place between January and March. Bekki threw an impressive 11.44m which was over a metre ahead of second place. Bekki now ranks 31st on the under 15’s Power of 10 All Timers list since moving up into the under 15 age group for this year’s track & field season. Birmingham were victorious in the under 13 boys team competition winning both the Obstacle Relay and 4 x 2 lap relays in an emphatic style. Individuals who weren’t part of qualifying teams were selected for a number individual events after outstanding results during the qualification events. Many of these showed their strength and justified their invitation including Marcus Austin of Surrey (Dorking & Mole Valley AC) winning the Standing Long Jump with an impressive 2.63m winning jump. Sunday 16th April saw the under 15’s descend on Manchester for their UK Final. Under 15’s compete for their team but also in the All Rounder competition in which they choose one track event, one jump and one of either Shot or Speed Bounce. Former all rounder champions have gone on to achieve international success in Track & Field Athletics including Morgan Lake (Windsor Slough Eton & Hounslow) who has recently represented Great Britain in both the High Jump and Heptathlon. With almost 80 athletes competing in the under 15 girls competition the strength of Birmingham was ever-present across the board with five of the six scoring athletes being placing in the top ten individuals. Birmingham and Donegal took the team titles respectively in the girls and boys competitions and Radix Mularwarman of Dyfed and Amber Anning of Sussex (Brighton & Hove AC) took the girls titles. The boys’ competition was closely run with Radix narrowly beating William Adeyeye (Thurrock Harriers). In the girls competition Amber took the title ahead of Cassie Ann Pemberton from Birmingham (Birchfield Harriers) Since the UK Final Amber has moved into the under 17’s for this summer’s track and field season and is currently ranked in the top 10 UK rankings for 100m, 200m & 300m. Almost a month on from the UK Final we look forward to witnessing many of the successful Sportshall UK Final competitors from this year and previous years compete in athletics across the summer Track & Field Season. England Athletics Championships take place in Bedford during August and we have no doubt there will be representation during the English Schools Track & Field Championships in July at Gateshead Stadium. Details of the 2017 UK Championships will be available during the summer months and the Sportshall development team are also looking forward to heading back to Manchester in August where teams from the local area will be invited to compete in an outdoor version of the Tom Pink Relays. This will take place before the brand new England Athletics Manchester International match which welcome teams and elite international athletes’ from England, Scotland and Wales.